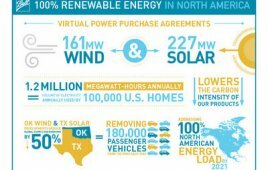 As part of a $34 million announcement by the U.S. Department of Energy (DOE) Secretary Rick Perry for Small Business Innovation Research (SBIR) and Small Business Technology Transfer (STTR) research and development projects, the Office of Energy Efficiency and Renewable Energy (EERE) will fund 87 new projects across 34 states, totaling nearly $13 million in funding. The Office of Energy Efficiency and Renewable Energy will fund 87 new projects across 34 states, totaling nearly $13 million in funding. This includes two wind-energy projects. This includes two wind-energy projects: Polnox Corporation of Lowell, MA, will develop environmentally friendly hydraulic fluids and lubricant formulations for turbine and hydraulic systems in hydropower stations, and Aquanis, Inc. of East Greenwich, RI, will develop a wind turbine blade-surface coating to reduce damage due to lightning. DOE technology offices award Phase I grants to small businesses that demonstrate technical feasibility for innovations during the first phase of their research. Most Phase I awards are for $150,000 for less than one year. If completed successfully, Phase I projects are eligible for Phase II funding awards, which provide up to $1 million or up to $1.5 million, depending on the technology. A sequential Phase II award can provide up to an additional $1 million. Congress created the SBIR and STTR programs to spur small businesses to advance innovation at federal agencies. DOE developed Technology Transfer Opportunity subtopics as a way for small businesses to partner with national laboratories on research and development needed to speed the commercialization of national laboratory inventions.